I'll just go right out and say it: Murdo got a job! I’ve been waiting to be able to say that for a long time. 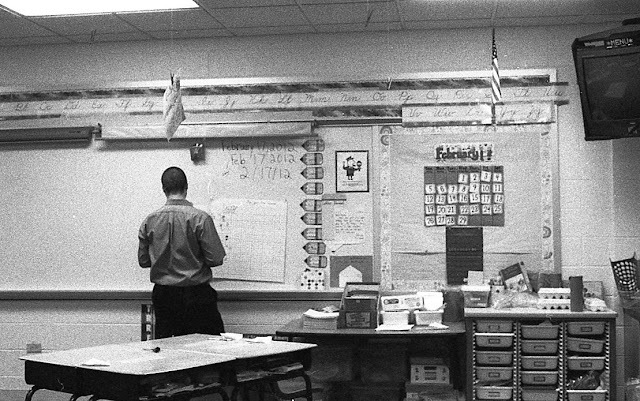 I’ve thought about this post, about the day when I would finally get to write it and tell everyone about how hard he’s worked, how proud I am of him, how we now get to say that he is a second grade teacher. I’ve daydreamed about the moment we would find out. I joked with him, saying that I would either cry or puke or both. When I heard him take the phone call yesterday morning, heard him clear his throat and say hello, heard him say, “Yes, I would absolutely love to,” my heart nearly jumped out of my chest. For days, my stomach had been in knots just thinking about that phone call. When he hung up, I didn’t cry or puke. I screamed. I jumped up and down. I ran to the bed where he sat and tackled him. I gave him a hug. Later he told me that my reaction was the best part. About five years ago, Murdo left his job as a manager at a heating and cooling company. He was making good money, but he was doing something that he wasn’t meant to do with his life. Instead, he went back to school to get a masters in education. To teach kids. He is so, so good at it. And I admire him every day for taking that risk, and for following his heart and his dreams. It’s something we’re told from a very young age -- to follow our dreams. He did it. During a time when school districts are making cuts and teachers are having a hard time even keeping their jobs while others just simply won’t let go and there are thousands and thousands of people just like Murdo, fighting to get in the door. During the three years since he graduated with his education degree and teaching certificate, he has been fighting. Subbing, tutoring, teaching summer classes. Applying for jobs, networking, updating his resume. For three years, we have been waiting. And I started struggling with the idea of following one’s dreams, and wondering if it really does work out for everyone. Because what they don’t tell you is what to do when your dreams just seem out of reach. When you’re grasping for them, and coming back with nothing but disappointment. Frustration. A loss of hope. I was afraid that it wouldn’t happen for him, for us. What do you do when you follow your dreams and nothing happens? How do you recover from that? I’m not sure what the answer is. But even with those doubts in the back of my mind, I knew that the only thing he could do was to just keep going. “Just stick with me,” he always tells me. “Everything works out in the end.” The last few years have been rough, and we’ve been holding our breaths for a long time. Finally, a sigh of relief. A weight lifted off our shoulders. Everything worked out, Murdo. And I know this is far from the end. This is the beginning. We have made it to the beginning, and there will be more struggles ahead, but for now, there is nothing to do except to say that you did it. There is a lot to celebrate around these parts lately -- a new house (thank you all for the kind comments on the last post! ), a new job, a new beginning. Last night, we celebrated at Bob Chinn's with a feast of steak and crab legs. Tonight, with one of Murdo's favorite pizzas. And here, with root bear floats. I know you probably don't need a recipe for root beer floats, but I thought I needed to give you something of a treat for celebration's sake. Murdo made me my first root beer float just two months ago. Can you believe that? There is a moment during the perfect root beer float when vanilla meets fizz, and something really delicious happens, and you know it's something special. Something worth celebrating. Scoop the ice cream into the glass. Fill the rest of the glass with root beer. Insert spoon and straw, and toast to following your dreams. I love this post for a lot of reasons, but mostly because it is light at the end of the tunnel, hope restored, dreams fulfilled, joy. Jacqui, I am so, so happy for you, and so, so happy for Murdo and I love getting to read about this time of celebration here. YAY! This is such wonderful news! Well deserved. I hope the two of you celebrate hard. My husband and I were out of work for a year, both of trying to find work that we were good at, that we loved. It can be so defeating some days. I am very excited for the both of you! Yes, it can get frustrating. But consider the alternative: being miserable doing something you hate. Is it worth it to take the easier road? That can't be what this life is for. Thank you for the sweet words -- I hope you've found what you were looking for, too! congrats to Murdo! this is such an uplifting and faithful post. thank you for sharing. all the best in his new job, and y'all's new home. Thank you, Lan! I never really considered myself a person of faith, but you're right -- it's about having faith in oneself, in one's abilities, in marriage, in life, in everything. Yay Murdo! So happy for both of your. Such a well written (as always) and inspiring post. Jax! You just had your first rootbeer float?! What other perfect treats have you been missing out on? Fif told me that Emily only recently had her first s'more. I may need to start a campaign to bring rootbeer floats and s'mores to people. Thanks, Les! Yes, first root beer float. For no good reason, I thought I didn't like root beer. Then I combined it with ice cream and I kicked myself for missing out on such a treat. I've definitely had s'mores. That is so wonderful! It's so great when someone follows their dream and is finally rewarded. Go, Murdo! I cried through your post! He should talk to my mom next time he is in town! She was a 2nd grade teacher for 30 years who just recently retired. She probably has a bunch of stuff she could give him, as well as advice. I really liked this post - very uplifting. I dove into a career path I knew would be a constant battle, and often need an encouraging word or two. Thanks.